“Case Of The Ex” may have given this performer a big crossover hit in later 2000, but it was this followup to it that I always preferred, especially the radio remix which gave it a bit of disco breakdown in the middle of it. It didn’t fare as well nationally, but she got back into the groove that summer on a #1 for five weeks on my chart, “Lady Marmalade”. Don’t be fooled by the rocks (or chart position) that she’s got; the dancing diva was hot stuff. During the first month of 2001, Lopez became the only act to have the #1 album (J.Lo) and appear in the #1 film (The Wedding Planner) in the U.S. during a given week. That’s big business. Further singles “Play” and “Ain’t It Funny” would also crack my top 5. They dialed and dialed, got a few answering machines along the way, but still managed to hit #1 for two weeks in early 2001. It was the second single from Black & Blue following “Shape Of My Heart”. You may remember that it received a remix by The Neptunes, which got some play. Their career came to a low battery warning for me soon afterwards. When Eminem‘s “Stan” became a mid-charting single on both the pop radio chart and my own survey in late 2000, it was the sung hook by this singer that eventually outranked it. Originally featured on the soundtrack to 1998’s Sliding Doors, it had an unusually long run to a prominent chart peak, but one that landed her a handful of entries on my list. The lead singer of this trio attended the same high school that I did, Bancroft School in Worcester, MA. Fun fact of the day, I suppose. That would be Matt Scannell, who lived in MA for a time. His band’s third consecutive top ten hit on my survey would be the last from their 1999 Everything You Want album. They’re an independent act nowadays. Formed in 1995, the California group rapped their way to a hit on both the Alternative and CHR radio surveys. It also led the Hot 100 for two non-consecutive frames. Leader Shifty Shellshock charted with two solo songs after the band’s sole entry: “Starry Eyed Surprise”, a 2002 feature with DJ Paul Oakenfold, and “Slide Along Side” in 2004. There ain’t no charting like an S Club charting, at least in my opinion. “Dream” became the septet’s biggest single to hit my chart and their last. It spent three weeks at #1. A followup, “Don’t Stop Movin'”, was planned for a radio servicing, but postponed after the events of 9/11. They split in 2003, but rumors of a full reunion have been around for years. The boys from Boston were about take the reins on my chart for a week, but on this particular survey, they were up to #3. Parent album Just Push Play was certified Platinum thanks to the song’s success. Followup “Fly Away From Here” just missed my top ten. They last charted in 2012 with the ballad “What Could Have Been Love”, which rose to #12. 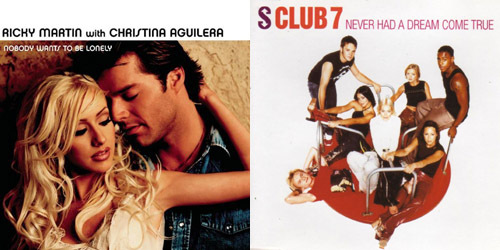 Originally just a solo song by Martin on Sound Loaded, Aguilera was added on for its single release. This was Martin’s penultimate top ten single on my chart; he also hit with “Loaded” a few months later during a quick chart run. Aguilera reached my top ten earlier this year on a duet with duo A Great Big World, “Say Something”, which climbed to #2. Call it a divine ditty of sorts. It went to #7 on the Hot 100 for Merrilee Rush in 1968 and then up to #4 in 1981 for Juice Newton. The song was “Angel Of The Morning”, and of course, it’s been recorded plenty more times beyond these two hit versions. Well, the Jamaican rapper and Barbadian singer flipped it up, interpolated it into a chorus, and gave us the song that was #1 on my chart this week in 2001 for its last of three weeks. It’s a classic that I still love now.